As in much of the rest of the country, demand for Nelson and Marlborough dairy properties was subdued during the summer, with vendor expectations exceeding what purchasers were prepared to pay. How quickly this gap closes remains to be seen. For pastoral and viticulture land, however, relatively few properties were offered for sale, with eager purchasers on hand to acquire those that were. Farmers motivated to capitalise on abundant feed produced by the exceptional climatic conditions rather than going to the property market. Recent notable sales include a 234 hectare Okaramio farm that changed hands in January for $2.25 million and an extensive 1134 hectare Seddon hill block that sold in February for $2.75 million. Meanwhile, a 500 hectare St Arnaud grazing block should create strong interest when offered for deadline sale in the autumn. Two North Canterbury sheep and beef farms sold well in November: 843 hectare Randolph Downs, north of Amberley, and 583 hectare Timpendean, at Weka Pass. Both well-regarded properties, each drew considerable interest before changing hands for around $1200 per stock unit. Through summer, the volume of sales reduced, with relatively few farms for sale. Canterbury dairy farmers are not offering property to the market in the same numbers as in other regions, though the buyers’ market for dairy property elsewhere is providing the region’s potential purchasers with greater choice and therefore reducing their price expectations. Interest in larger dairy units is restricted. Canterbury properties demonstrating environmental sustainability will attract market interest. Hurunui Water Project shareholders are set to determine whether their scheme will proceed in March, though this date may be extended. Land use change and property transactions will be made based on that decision. West Coast dairy farmers intend to see out the trough in the cycle that continues to afflict them, even when the outlook in other regions has improved. With local co-operative, Westland Milk Products’ payout currently projected at between $6.20 and $6.60, most farmers should be in the black, though are generally focused on repaying debt. While banks are being patient with their clients, few of the region’s farmers are motivated to buy or sell land in such a market. In a positive indicator for the future, Westland Milk recently announced that large corporate farmer, Southern Pastures LP, will supply the company from the 2018-19 season, adding an extra 4 million kilograms of milksolids to Westland’s annual collection. Such a positive statement should help raise confidence in the region, which will eventually translate into increased rural property market activity. 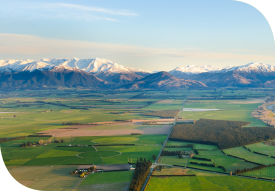 Enthusiasm to purchase Mid and South Canterbury dairy and arable properties was lower than anticipated during the summer. Farmers are wary of Mycoplasma bovis, which first surfaced during the spring and continues to cause local anxiety. This is one factor that has made identifying purchasers for larger dairy properties particularly challenging. Smaller farms are also proving difficult to sell. However, one Mid Canterbury arable listing, a 127 hectare Dorie property, is likely to change hands early in the autumn, and will be closely watched. Some farmers are showing signs of financial strain, though with banks apparently applying little overt pressure to date, it may take some time, if ever, before that transforms into an increase in property listings. Otherwise, interest in the region’s sheep and beef farms is stronger and, the better the quality, the more satisfactory the sales outcome. Dry conditions have prevailed in Otago since the start of the year, with many farmers exiting surplus livestock to more northern regions. Summer rural property market activity was slow, with few sales being completed since Christmas, although Central Otago lifestyle and residential properties did transact in reasonable volumes. Several attractive listings are receiving plenty of attention, particularly in South Otago though, in most cases, prospective buyers need to sell before they can purchase. Some financial institutions have tightened their lending criteria and are not initiating new borrowing at present. While product prices, schedules and interest rates have never been better, these financial constraints have curtailed rural property sales in Otago, frustrating both vendors and purchasers. This situation is likely to continue in the autumn. Southland’s rural property market was active early in summer, with new properties offered for sale and buyers keen to take advantage. Grounds for optimism included improved dairy prices, a stronger lamb schedule and beef returns remaining firm. However, as summer progressed, drought conditions took their toll and buyers became more concerned with what was happening on their own farms than pursuing other business opportunities. Those sales that did occur remained at values consistent with farm transactions during the spring. Buyers are predominantly local. One listing that is worthy of serious consideration is the 490 hectare property at Waimahaka, Southern Southland. This property is located in a reliable farming district and is an exceptionally well presented medium scale sheep and beef unit with further options to dairy graze in the future.